Our woods are probably at their most beautiful during the spring. This week we welcomed the Royal Forestry Society here on a visit, and I filmed some video as we went round, adding some stills and a commentary afterwards. This really gives you a feel for the woods and their wildlife. It lasts about 11 minutes, but in reality it takes about an hour to walk round. The phrase “cute” doesn’t usually apply to insects – furry and feathery creatures are often considered cute, but insects? I think it is a question of how you view them, interact with them, and present them in your pictures. Interact with insects? Obviously, insects will fly off when disturbed, but can you really interact with them? 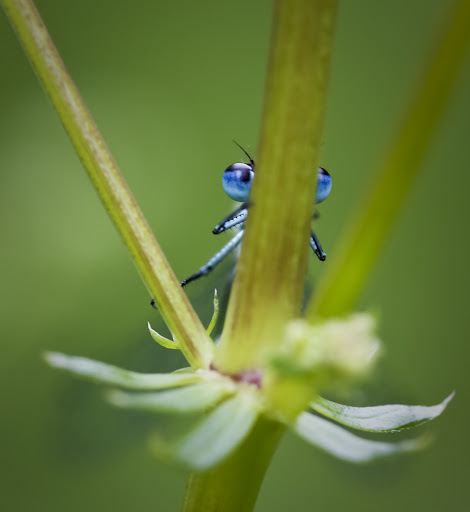 Certainly with damselflies, I’ve found it possible to play a game of peek-a-boo, the damselfly hiding behind a stem or leaf, and rotating round to try and stay out of sight, while peeking with one eye to see where I am. Butterflies, too, can interact. Perched on a flower, they may be trying to decide whether or not to trust you. If you move a bit closer, the fore-wings may extend a bit, ready to take off, and then be tucked away again when you back off. If they really trust you, they may go on feeding, allowing you to get pictures of their long extending proboscis and tongue. Ladybirds are another interactive insect – again, often hiding just out of reach of the camera, stopping to assess the photographer, clean their face, and potter off on their business. I think insects can be really very cute indeed, and that it is certainly possible to interact with them. Try taking a closer look – you might be surprised! 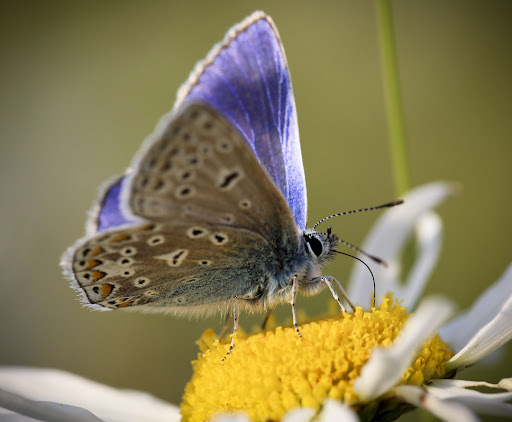 Although I have enjoyed wildlife photography for many years, I have been mainly focused upon butterflies and birds. 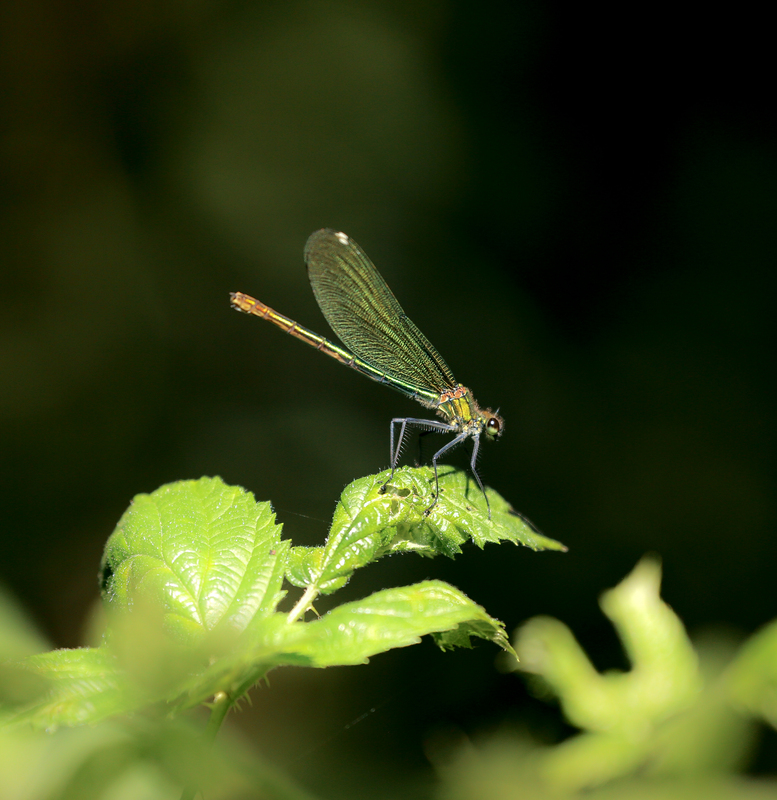 It is only since we became the owners of Alvecote Wood and put in eleven ponds that my interest in dragonflies and damselflies has been ignited. 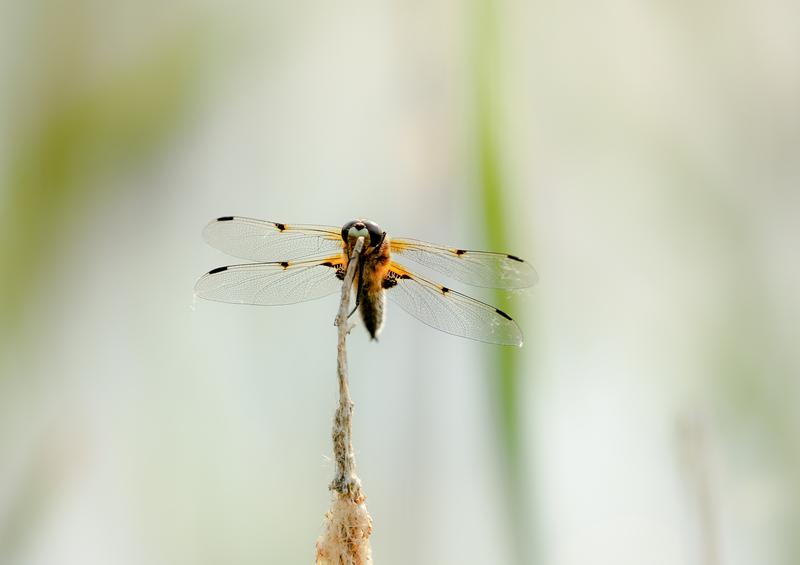 Dragonflies and damselflies are really fascinating insects, belonging to a very ancient order of insects. They also have a fascinating life cycle, with many species taking years to reach maturity, almost all of that time spent underwater in various stages of nymph, although some can complete a life cycle within a single year. The adults that we see are thus the culmination of a long period of development, and their life span is rather short – just a few weeks at most. 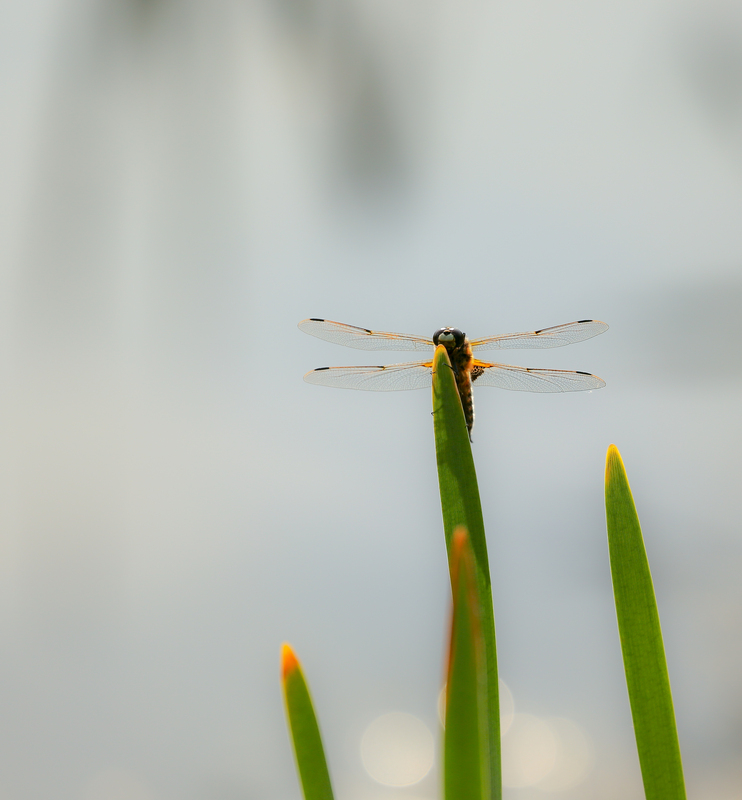 Although they need wet places, usually ponds, sometimes rivers, streams and canals, to breed, they can be seen a long way from those water bodies, and we often see them resting on leaves, trees, twigs and plants within our main woodland, some distance from the ponds. 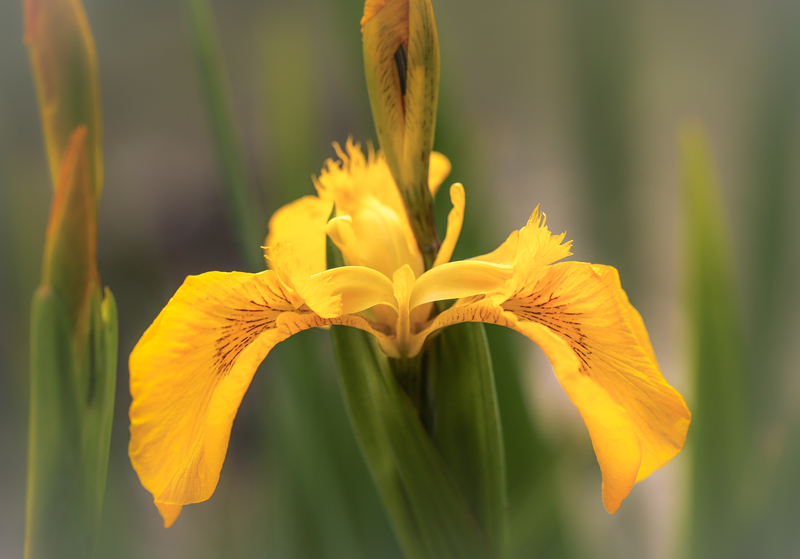 Most are predatory on smaller insects, worms, grubs and even small fish. Our ponds have become home to an increasing range of species, although we have no uncommon species in our woods. As with birds and butterflies, I take an interest in, and enjoy taking photographs of, the commoner species, as well as the rare ones – they are often surprising, with iridescent colours that glow in differing light, always changing, and always beautiful. 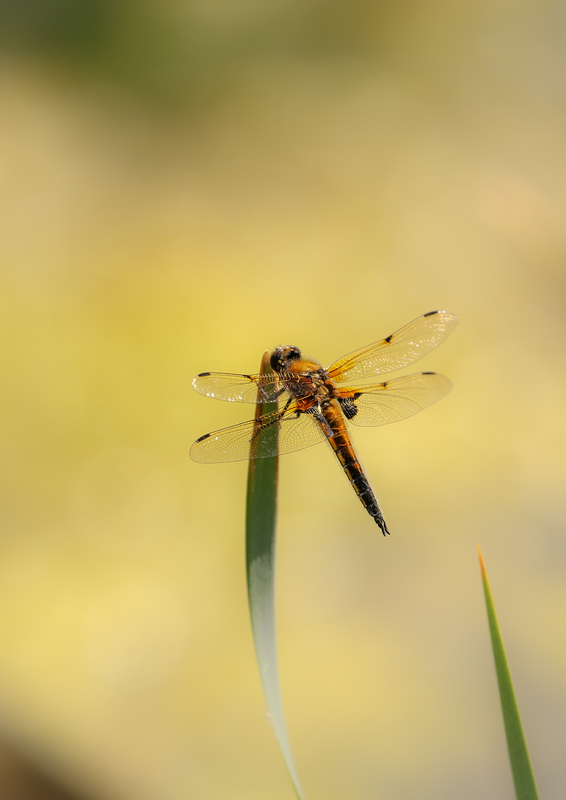 I could happily watch the numerous four-spotted chasers and emperors ranging over our ponds all day, defending their territories from all comers. 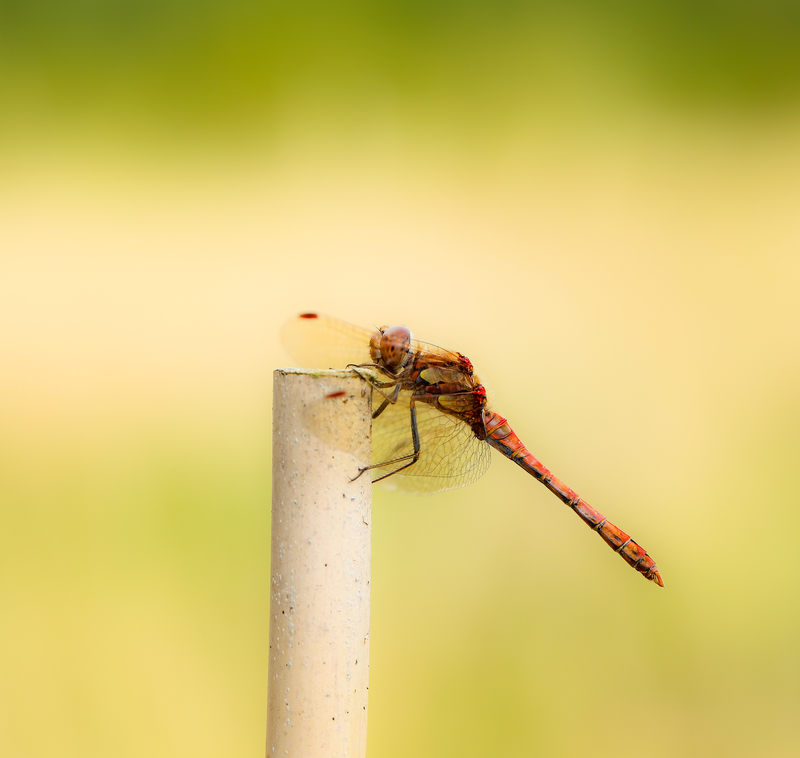 Most of them will perch and watch on dead stems of reeds and sedges emerging from the shallow water, although the common darter will also sit on a stick almost anywhere, including the canes that we use to stake our young trees. 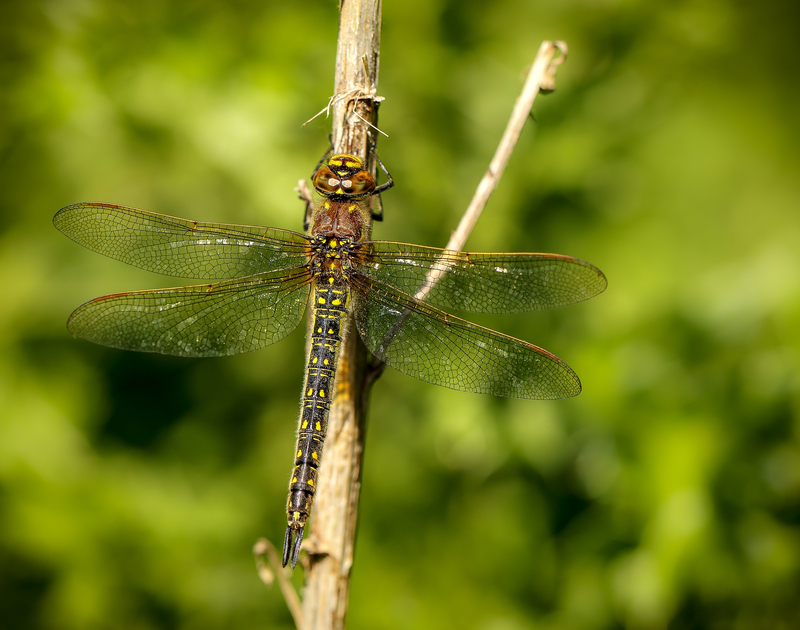 The hawkers, too, will range into the woods where you can find hairy dragonfly, migrant hawker, southern hawker and brown hawker at different times of year. 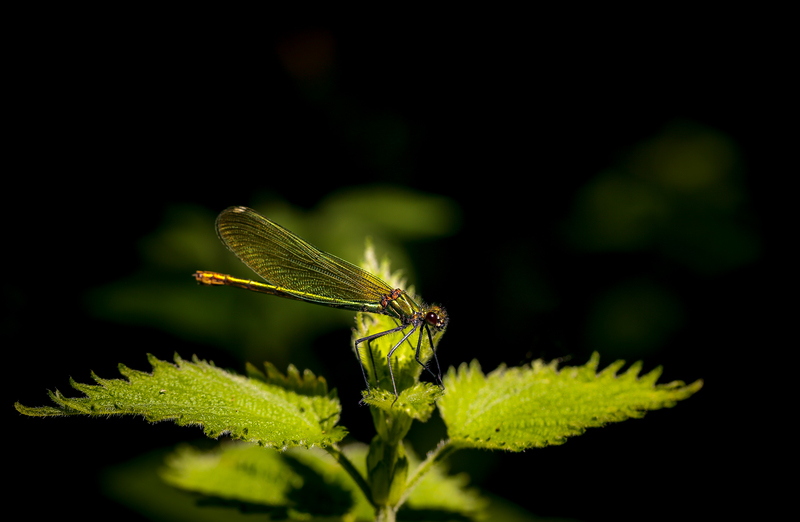 Damselflies are much more delicate – they usually sit with wings folded, rather than out to the side, and both wings are similar size, whereas the dragonflies have one large wing and one smaller one on each side, rather like butterflies. 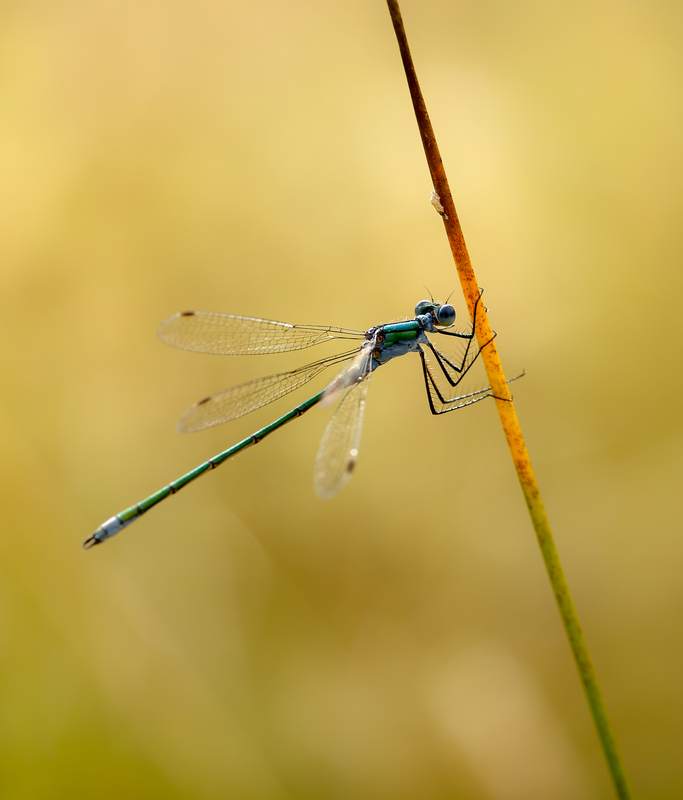 In summer there is a small cloud of little azure and large red damselflies, together with the beautiful and delicate blue-tailed damselflies, hovering over the ponds, mating, and depositing their eggs below the surface on submerged stems. 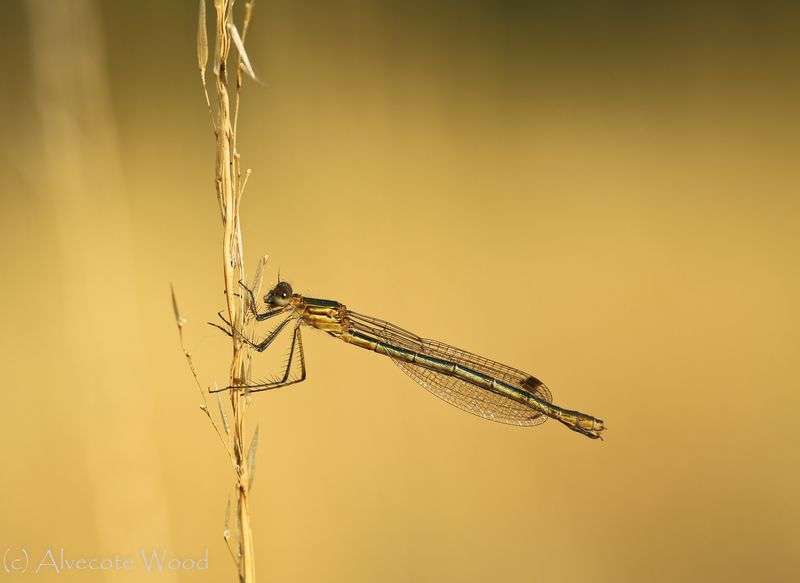 The larger damselflies such as emerald and the lovely banded demoiselle will range more widely and are often seen perched in the meadows or on twigs and saplings. 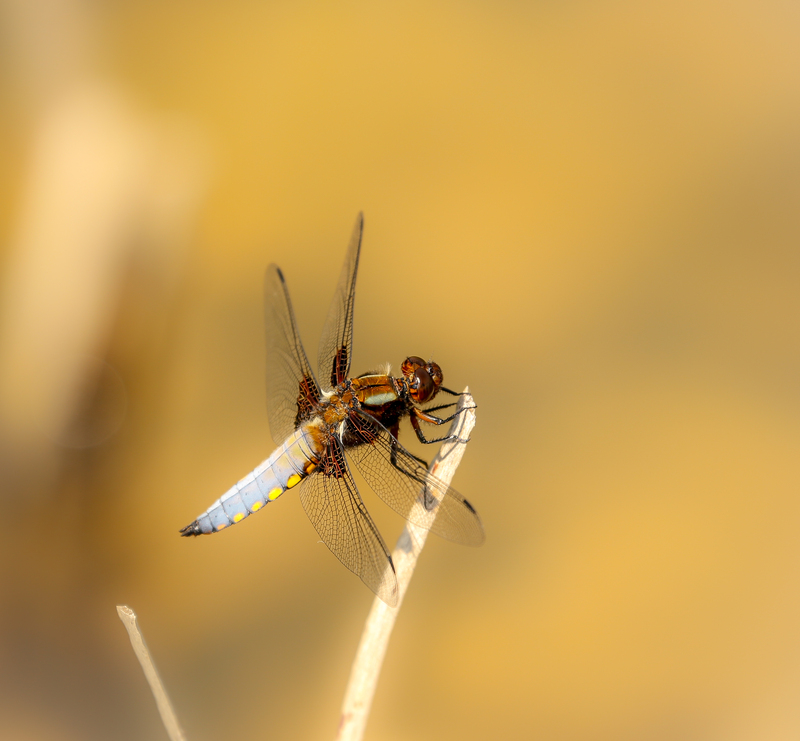 The increasing population of dragonflies and damselflies have themselves attracted predators in recent years, including the Hobby, a small falcon that feeds on them. 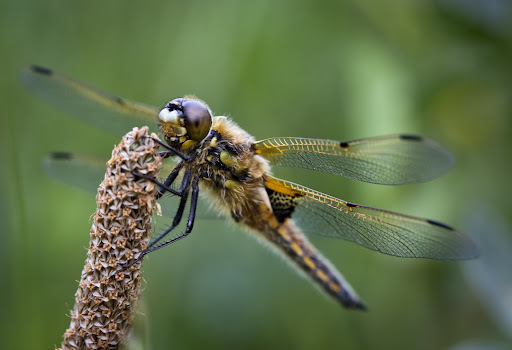 Dragonflies and damselflies are worth a closer look. They are primeval, beautiful and always surprising. If you want to improve the biodiversity of a piece of land, one of the best things you can do is put in a pond. We are lucky that our woods are damp, there is water flowing through them, and they have a clay soil base which is eminently suitable for ponds. We started out with one pond that was badly-designed and silted-up. As part of our programme to improve the site for wildlife, and to rationalise the drainage, we put in three brand new ponds in the upper part of the woods, and divided the old pond into three new ponds, terraced along the ditch. The first pond is a silt trap and the remaining ponds now keep free from silt, and drain properly back into the ditch. When we had the opportunity to buy Betty’s Wood and plant it with trees, we also added ponds – it was a very suitable field, with lots of damp patches and a base of both red and white pottery clay. There were already some natural ponds formed in tractor ruts, and we added 5 more ponds in a cluster. This means we have 11 ponds on site, in three clusters. There is another pond which is more of a pit that gets damp in winter – but these temporary ponds are also very valuable habitat. All of them were put where a pond would naturally want to form, in areas that were already damp. None of them are artificially lined – the clay keeps the water in place. Some of them dry out in the summer, others stay wet. All are connected so that wildlife has a refuge in the deeper water if needed. 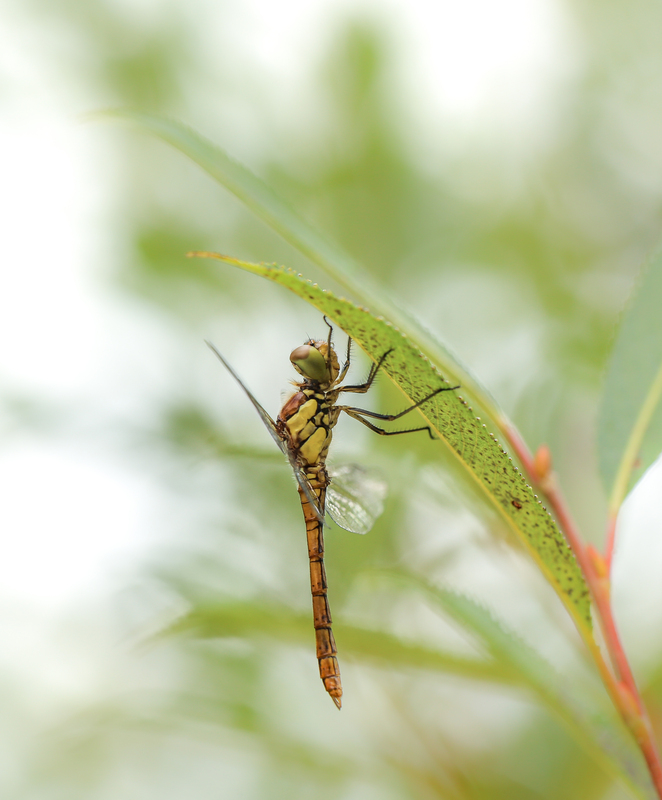 We were rewarded in the first year with a few dragonflies and damselflies. As time has gone on, our ponds have brought more life to the woods. 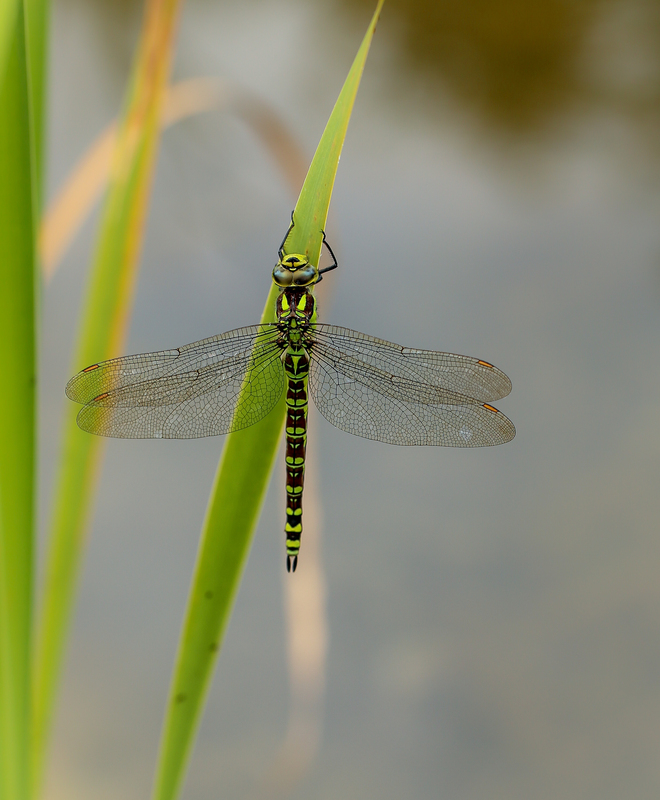 The range of dragonflies and damselflies has increased, helped by the fact that we are adjacent to other pools and ponds, a canal and a river. Birds regularly come and drink in the ponds. We have a good population of toads and smooth newts, together with a few frogs. We have some resident mallard who come back each year although are yet to breed successfully. Last year we had a pair of lapwing in Betty’s Wood. 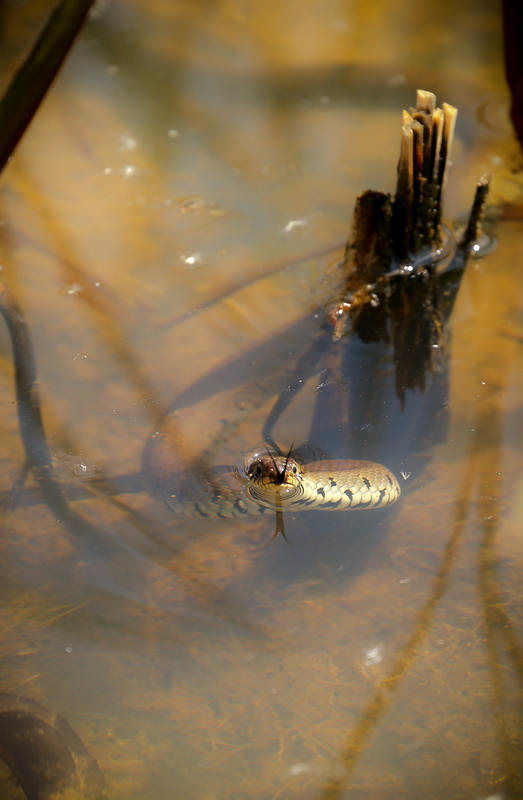 We have an increasing population of grass snakes who love to swim in the ponds and bask on their banks. Swallows swoop down to feed on the insects that breed in the ponds. Last year we had a Hobby, which likes to feed on dragonflies. Mammal tracks show that all our resident mammals drink at the ponds – muntjac, badger, foxes, squirrels, rabbits, stoats. Insects also come to drink at the ponds, particularly butterflies, bees and wasps. 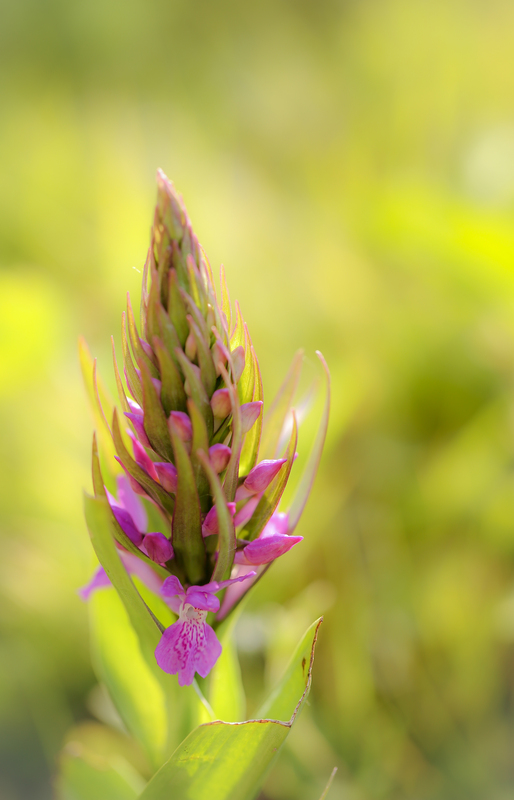 Around the ponds are wet areas, in which we get wonderful plants – cowslip, buttercups, snakes head fritillary and a growing area with southern marsh orchid. As well as the usual sedges, reeds, rushes, flag iris, ragged robin, teasel and figwort. Ponds bring a place to life, and putting them in was one of the best things we have done for wildlife at the woods. 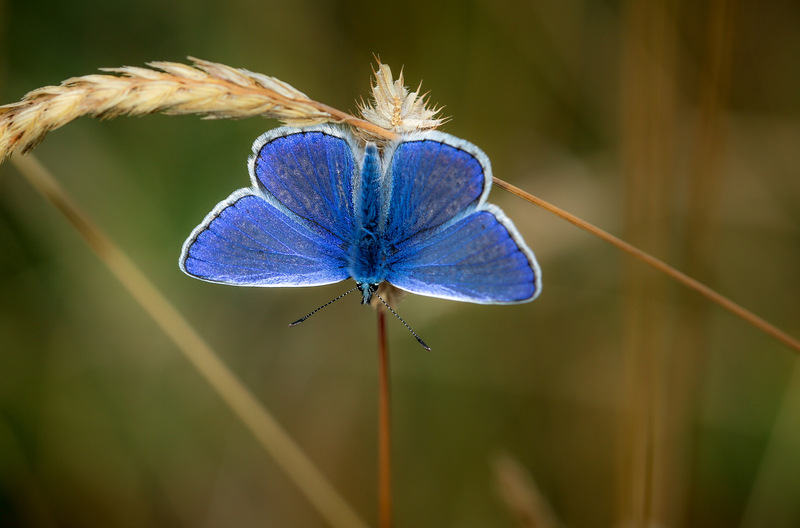 With the warmer weather, we have seen the first butterflies emerging in the woods, as well as the first dragonflies and damselflies. The first spotted on the wing were brimstones, but we now have good numbers of green-veined whites, orange-tip, speckled wood, large white and small white, as well as the rather dusty and ageing peacock, small tortoiseshell and comma which overwintered as adults. 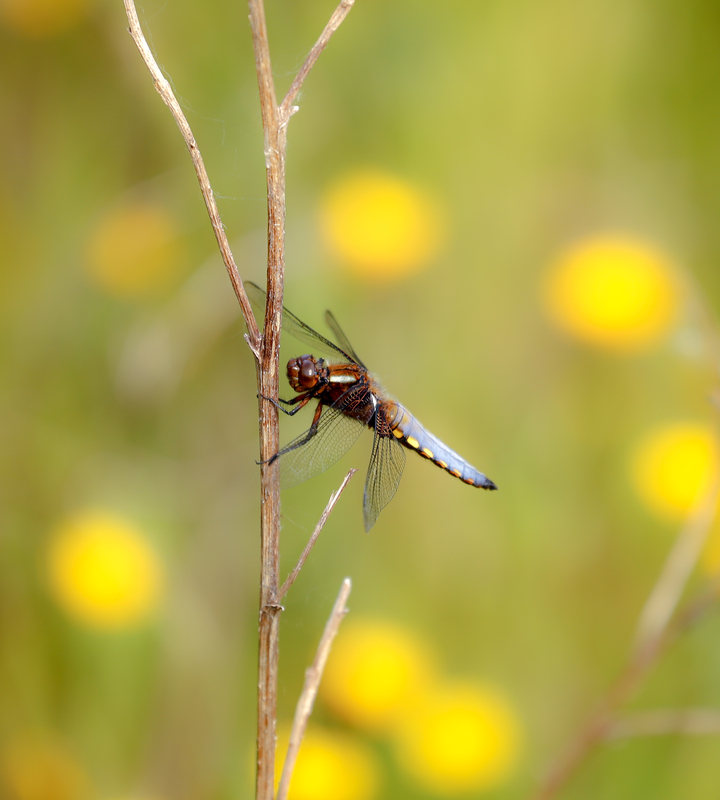 The large red damselflies were the first to emerge, but in the last few days we have also seen azure damselflies coming out, and the first two female broad-bodied chaser dragonflies. We are also delighted to report a good patch of violet growing in the woods, which we hope will be food plants for the caterpillars of silver-washed fritillary – this butterfly is moving our way, and we have ideal habitat for it. Fingers crossed! 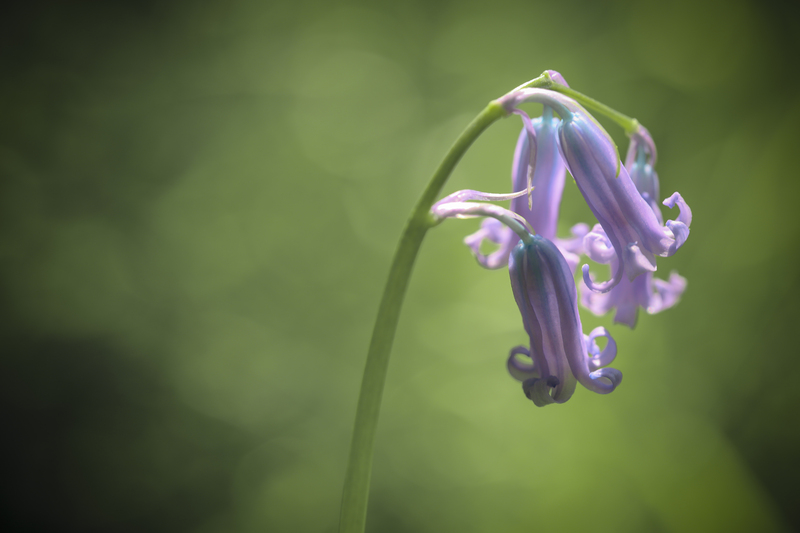 The bluebells are also stunning at the moment – just past their peak, but still putting on a fantastic show. They look particularly wonderful when growing together with clumps of white stitchwort. Red campion is now in flower as well as the first ragged robin near our ponds, and the buttercups are just starting to come out. The woods are in full leaf now, and the acid-green colours of spring are just wonderful to behold. It all looks quite magical in the evening light. 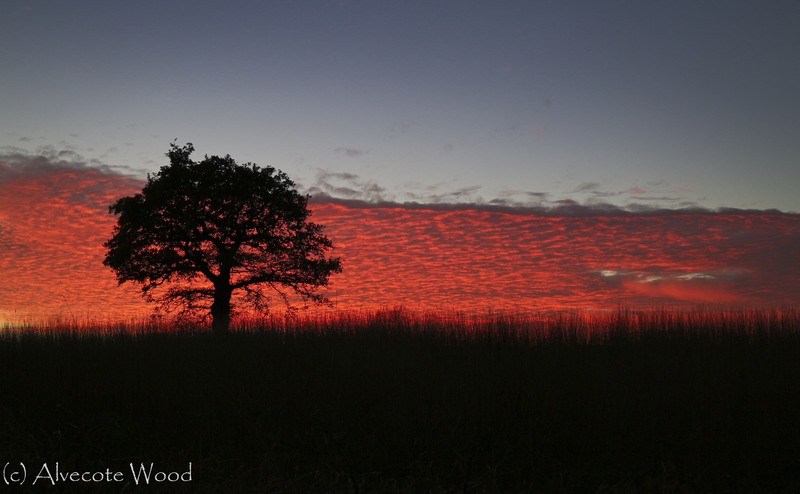 There have been some fantastic photographic moments at Alvecote Wood during 2013, and I would be really grateful if you could vote to help us pick the best image from 2013 from the shortlist. Compiling the shortlist has in itself been quite difficult, but I’ve tried to pick images that speak to me of the beauty of the woods, but that also showcase the wonderful variety of plants and insects that live there. 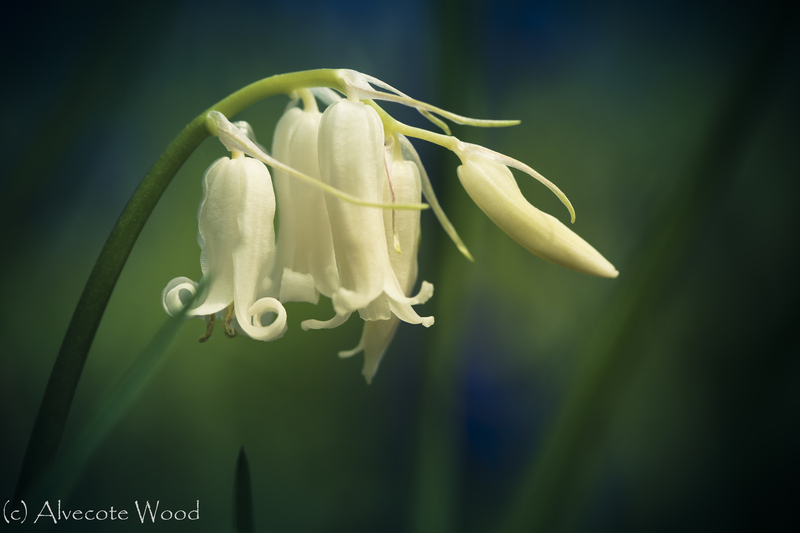 There is just so much to photograph at our wonderful woodland wildlife site, Alvecote Wood. Every year, I try to produce a photographic yearbook that highlights the beauty of this site through the seasons – light and colour, insects and birds, flowers and fungi and the stunning views that are to be seen there. Our yearbook for 2013 is now available via the Blurb bookstore, featuring images from the wood throughout the year, as well as a few images from other places that we have visited. There is a hardcopy version, as well as an e-book and pdf version, all available via Blurb. 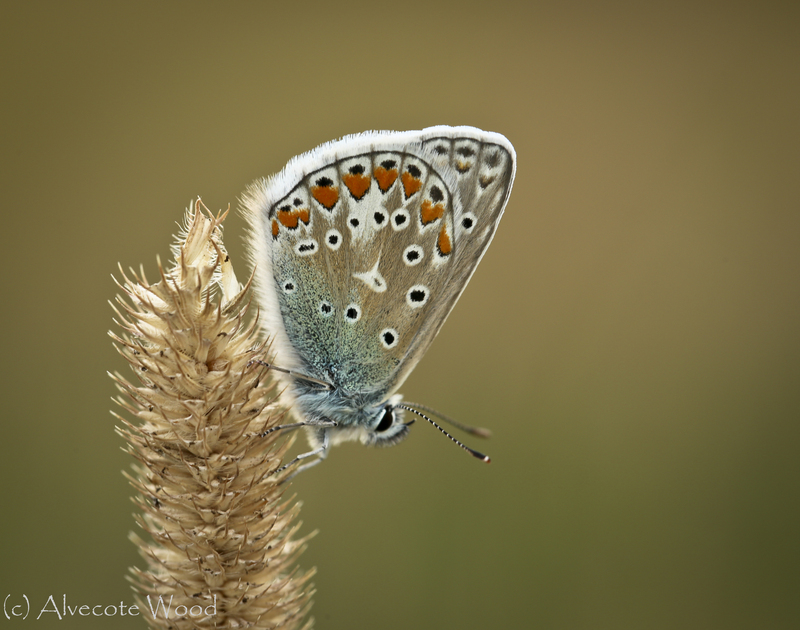 We only make a small amount from each sale, but every sale will help to support our conservation work at Alvecote Wood, so please do consider purchasing a copy. A full preview is also available by clicking the badge below. 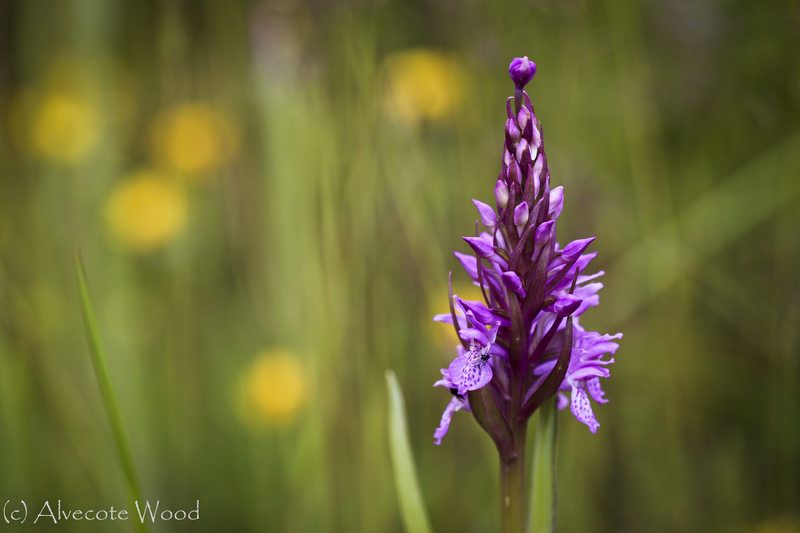 Last year was a drought and this year has been a deluge – and it is obvious what Betty’s Wood meadow and trees prefer! We have had some worrying moments since the meadow was planted in October 2010 and the trees in February 2011. Despite a great display of poppies last year, the perennial wildflowers and the grass sward in particular were very sparse – after a year of growth you could still see the lines made by the seed drill. 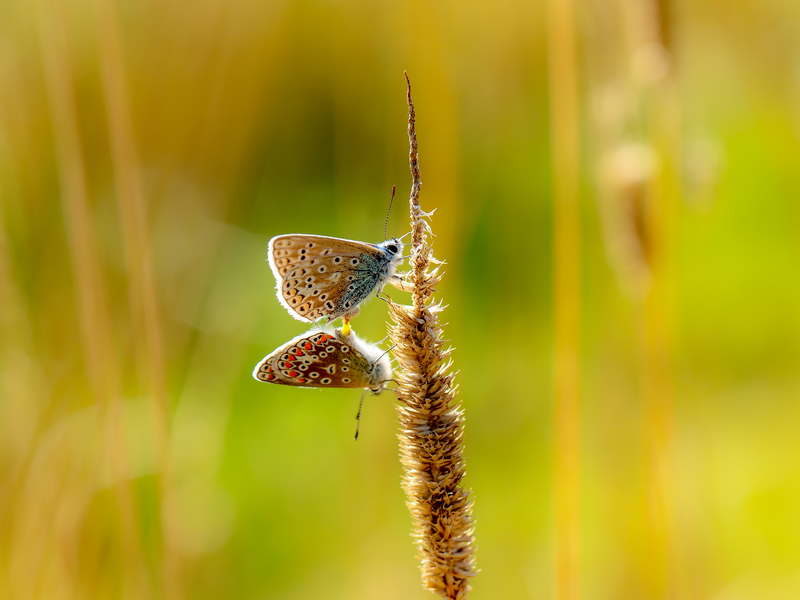 The diversity was also low, with little in the way of the important butterfly foodplants, such as birds-foot trefoil. Some areas had barely any growth on them at all, and newly-planted areas of wildlowers on top of the spoil removed when we dug the ponds had just a tiny green fringe. 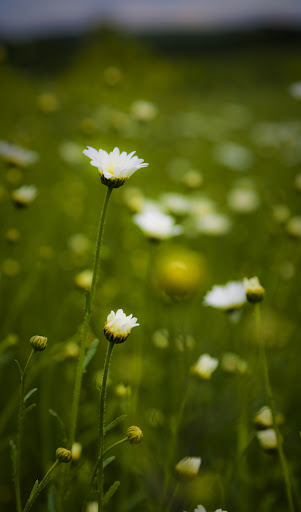 The largest meadow was so sparse that when we mowed it, we were throwing up dust from the parched and cracked surface, and there were few clippings left from the sparse mayweed and poppy growth. The trees, too, had suffered, despite our best attempts to water them. Although we ended the year with 5% loss plus 1% stolen out of our 5000 trees, some were not in the best of shape. In particular, the species we had planted in the area that is normally wet (alder, varieties of willow, poplar, aspen) had struggled to put on any growth at all, and in places, had managed only one or two leaves. This year started badly too – a drought through March left us wondering how we were going to cope through the summer. We needn’t have worried – although the rain has not been pleasant for humans, and at times we have had problems with the quantity (including a flood in the woods that almost washed away our bridge), the trees and meadow have loved it, and responded with growth that we could only have dreamed of last year. Standing by the ponds last night, I could hear the leaves of our little aspen trees as they trembled against each other – aspen is the only tree in our wood that you can identify by sound! Last year, they had a couple of leaves each, but this year, enough to make a noise. Our cloned willows are growing enthusiastically. Some of our trees are now about 5 feet high and others are showing great recovery growth. Areas are now beginning to look a bit like a young woodland, rather than a parched meadow with a few sad trees in it. And the meadow! Oh my goodness, the meadow! We have such lush growth it is hard to walk through it. The grasses, yellow rattle, beautiful clovers, medick, sainfoin, tufted vetch and large patches of birds-foot trefoil. And daisies. Lots and lots of daisies. Over a million ox-eye daisies. 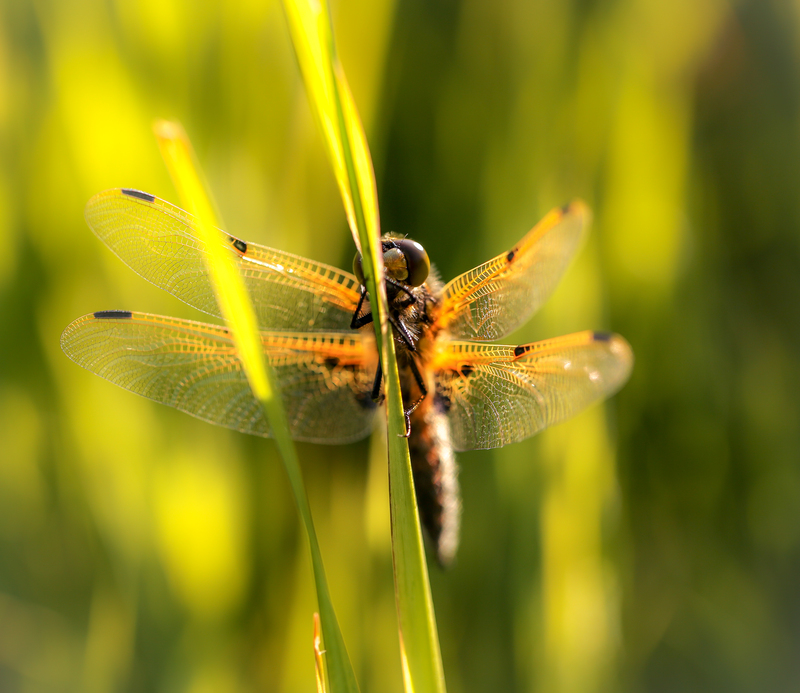 With the meadow and improvements to our ponds have come insects – thousands of insects. 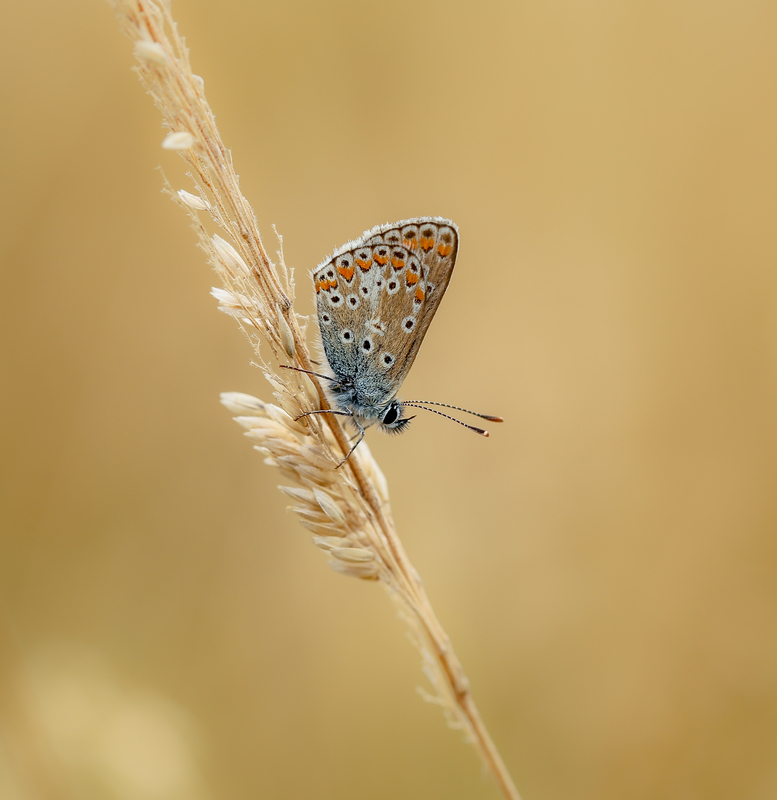 We have a really good show of common blue and brown argus butterflies this year. We also have small heath butterflies for the first time, and to our delight, the dingy skipper has arrived too. Almost every flower has a ladybird, some kind of bug, beetle, fly, bee, hoverfly, spider or other living thing on it, feeding from it, and enjoying it. The grass is thick enough for us to see vole and rabbit tunnels and pathways. A skylark is sussing out potential nesting spots. 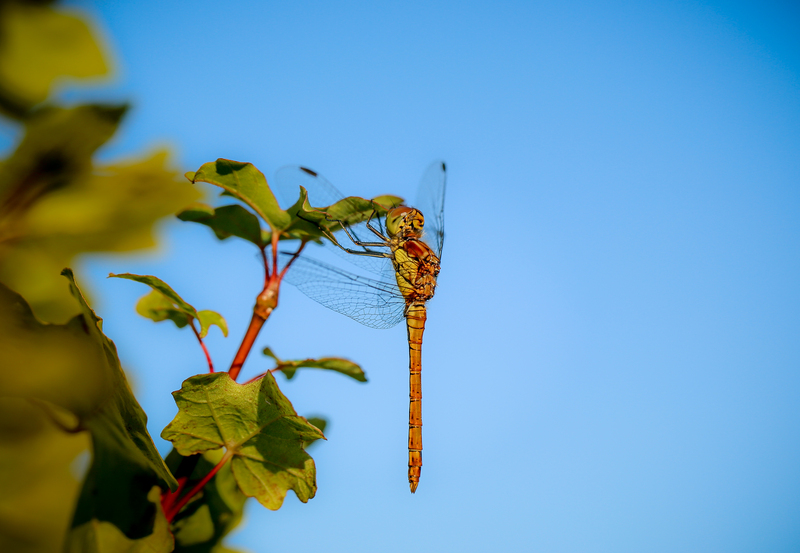 Our ponds, too, are showing increased diversity of life, including common blue, azure, blue-tailed, red-eyed, white-legged and large red damselflies, as well as the four-spotted and broad-bodied chaser dragonflies. As you walk through the meadow, little clouds of azure damselflies rise up and settle again. The contrast with the agricultural land over the fence is staggering. We complain about the rain. We complain about having to wear wellies and a raincoat in summer. But the rain has wrought a transformation that outweighs the inconvenience. The meadow has come to life.